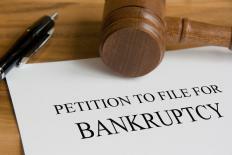 When a corporation becomes insolvent, it often seeks some type of bankruptcy protection. Insolvency is generally defined as a financial state in which a company can no longer pay its bills and other obligations on time. This occurs whenever liabilities, or debts, exceed assets and cash flow. Once a company becomes insolvent, it must take immediate action to generate cash and settle or renegotiate current debts. Companies which cannot successfully pull themselves out of this condition often face bankruptcy proceedings, receivership, or liquidation of all assets. Commonly confused with bankruptcy, insolvency is not too dissimilar. Both conditions deal with liabilities exceeding assets, but insolvency is a state of being and bankruptcy is a matter of law. Companies can be insolvent but not legally bankrupt. Insolvency can lead to bankruptcy, but the condition may also be temporary and fixable without legal protection from creditors. Companies facing the possibility of insolvency can take steps to keep themselves financially solvent. Using existing lines of credit to borrow money is one way to avoid it, but it also creates more liability and new payment deadlines. Selling off assets to other companies is also a common hedge against the condition. Consumers may notice a local grocery store changing hands, for example. The original grocery store chain may be approaching insolvency and selling off 30 or 40 of its local stores in order to generate immediate cash for timely debt repayment. Another option for avoiding insolvency is acquisition by a larger corporation. It is not unusual for major conglomerates to seek out small but commercially viable companies for acquisition or takeover proceedings. Even if the smaller company is currently flirting with insolvency, the rights to its signature product lines may prove valuable enough to save it from financial ruin. This happens quite often in the wholesale food industry. Struggling manufacturers of a popular product may agree to sell off all of their assets to a corporation with better financing. Insolvency does not necessarily lead to bankruptcy, but all bankrupt companies are also considered insolvent. Once an announcement of insolvency is made, stockholders may have to decide whether or not to sell off their shares or remain with the company until it can regain its financial footing. What Does It Mean to Be "Financially Solvent"? What is an Insolvency Order? How do I Declare Personal Insolvency? What is an Insolvency Administrator? If you have investments in retirement IRA's, can you still become insolvent? The investments are more than the debt. We have been settling credit card debt for five years and have been issued 1099's and have paid in big bucks to the IRS. I wanted clarification before filing the 1099C this year. People who are concerned with canceled debt income have an option. Yes, the canceled debt will be reported to the IRS, which results in a 1099 being issued to the party whose debt was canceled. However, such people can still qualify for Tax Relief from the IRS and the State Tax Agencies. As of March 2010, the IRS has introduced additional flexibility in its OIC program which basically determines the eligibility to qualify for a tax settlement. I had three houses that I rented out and due to the financial crisis my tenants ethier lost their jobs, were laid off and/or did not pay there rent on time or the whole amount. I robbed peter to pay Paul to try to keep them but the debt outward my income, which caused me to have financial difficulties. I short sale them and now I'm filing bankruptcy. The bankruptcy attorney said I would have been better letting them foreclose because I now have canceled debt that the IRS could consider as income. Am I insolvent? Regarding tax owed on debt forgiven. I spoke with a tax attorney today who told me that unless the house on which the debt is forgiven is your primary residence you will receive a 1099 because the mortgage company is going to write it off. Once a 1099 is issued you will have to pay tax on it. No ifs, ands, or buts. I had to move to a different location in order to find adequate schools to handle my two autistic children. I tried selling my house but couldn't so I rented it until the market turned. Now my tenant can't pay the rent. With the housing market turning upside down I now own two homes that are worth far less than I owe. Basically my liabilities outweigh my debts. Is there a way to avoid tax on 100k+ of forgiven debt if I short sell a rented house? We run our business out of our home and are currently trying to short sale the home. We are clearly insolvent, as the business has seen a downward spiral and their are no assets. I am wondering if we will still qualify for the tax relief if we run the business out of the home? I want to do everything I can to avoid paying taxes on the amount forgiven on our home when it sells or forecloses--because it would be a lot and we are already so behind. wanted to know how insolvency will help me to clear up a cancellation of debt, due to loss of job and not enough money to pay credit cards, now got IRS notice we must pay taxes on bal, please let me know ASAP. Great to the point article. Does this also apply to individuals who become insolvent and find themselves unable to pay their debt because of job loss and are not able to find work?